Most of my coaching has been in high performance programmes and when children were involved, the decisions about what was the correct age to start rowing was largely driven by the requirements of a racing programme and what we thought was healthy for the children. At Christ’s College, for instance, I influenced the decision way back in 1988 that has lasted (with one exception) till today that the 1st year rowers don’t go to the National Schools Rowing Championships, aka The Maadi Cup. I firmly believe that children shouldn’t start racing to soon, and I think 12 or 13 is too soon. This is particularly the case when the only racing we offer here is 2000m 8 lane standard adult style regattas. One of the reasons I am against having children racing normal regattas too soon is the large dropout rate almost all rowing programmes suffer at around the age of 15. I know that all the social and physical changes that 15 year olds are going through are tough and that a large drop out is probably something we have to live with. Still I think that having little ones start with adult rowing too soon is a mistake. One way of keeping young people in rowing is not too let them have too much too soon. If a 14 year old has raced at all the regattas available, been to the Nationals, “Been there done that” then they have less incentive to stay on in the sport. There are also questions for me about social development. To race properly over 2000m requires a lot of preparation and I am not sure that it is appropriate for a 12 year old to have to be as disciplined and organised as is necessary to race a crew boat properly. We should be careful about forcing young children into being little adults. This topic has been debated in NZ School rowing of late. That said I have seen plenty of young children keen to row and enjoying themselves in boats. My local club, Dunstan Arm, has a new programme this year for young girls. Jacqui van Dam has a group of 11 and 12 year olds who are messing about in boats, as it were. The aim is for them to have fun, to learn some good rowing technique, and, hopefully, to graduate to racing programme next year. 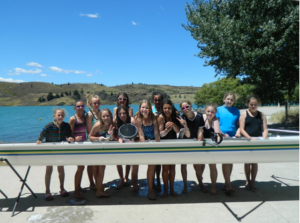 Dunstan is fortunate that they row on a lake with clean water and can offer a safe playground for this type of rowing. What does your club do for those too young or too small to race but who want to be out in a boat? This entry was posted in Club Management, Coaching, Juniors, Psychology, Racing, Rowing, Student, Training. Bookmark the permalink. Duncan, I’ve found your comments on club rowing both insightful, accurate and happily reflective of my own experience as a rowing club administrator. I would be interested if you could share your thoughts on how a club with a strong masters and junior base can also support an elite program. We have a small elite program that has had some great successes – I am grateful to the athletes who have achieved great heights that they continue to call WARC home. However, each year we find the number of atheltes willing to compete on the national for our club is dwindling. The cost is prohibitive – we are based in the world’s most remote capital city (Perth). The training is onerous as our club season is during winter, but “nationals” is in summer so these atheltes train and compete year-round. The small program (currnelty just nine athletes) costs us about 30 per cent of our total coaching budget, plus an outlay for transport, coach flights, accommodation etc. Fundraising from this small group only goes so far, as a result the elite atheltes are competing in a heavily subsidised program, supported by the endless rounds of Learn to Row and Corporate regattas we are running. I’d be interested in your thoughts on how to balance these competing interests. Happily, I do believe we have hit the right formula with our Learn to Row program and other aspects are looking up – this just seems to be an ongoing issue.